Purpose: A very large angle esotropia is characterized by an angle more than 80 prism diopters (pd). A single eye surgery would not correct such a large angle. Supramaximal recessions and resection would lead to restriction of ocular motility. 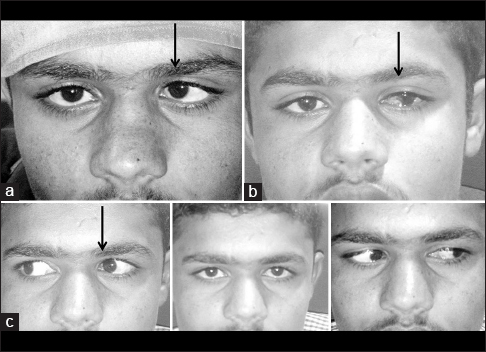 We present a series of 22 patients with large angle esotropia treated with muscle transplantation. Methods: A total of 22 patients (14 males and 8 females) were included in the study. All the patients had a minimum of 80 base out deviation in primary position. All patients underwent thorough preoperative orthoptic checkup and refraction. The patients were followed up on day 1, day 30, at 6 months, at 1 year, and 2 years. All the patients underwent standard muscle transplantation, where the resected extra stump of lateral rectus was transplanted to the medial rectus using 6-0 prolene which was recessed by a standard recession technique. Results: The mean age of the 22 patients was 32.21 ± 13.1 years. The mean preoperative angle was 92.4 ± 13.5 pd base out. The mean postoperative angle at 2-year follow-up was 12.3 ± 9.9 pd. The average correction achieved per mm was 4.1 ± 0.3 pd. The adduction restriction was <1 in all the patients at the end of 2 years except one patient. The abduction was normal in all the patients. Conclusion: The true muscle transplantation is a safe alternate option for large angle esotropia when uniocular surgery is desired. The surgical results are stable in long-term and therefore a viable option. A very large angle of esotropia of more than 80 prism diopters (pd) cannot be treated by a two horizontal muscle surgery., True muscle transplantation for such abnormally large angle esotropia has been tried, but the experience is only for nine cases.,,,, We did a study of 22 patients with very large angle esotropia and assessed the long-term stability in such a large case series. A total of 22 patients (14 males and 8 females) were included in the study. All the patients had a minimum of 80 base out deviation in primary position or more. All patients underwent thorough preoperative orthoptic checkup and refraction. The patients were followed up on day 1, day 30, at 6 months, at 1 year, and 2 years. All the patients underwent standard muscle transplantation, where the resected extra stump of lateral rectus (LR) was transplanted to the medial rectus (MR) using 6-0 prolene which was recessed by a standard recession technique. The surgical technique has been described elsewhere by the author. The MR muscle MR was dissected and separated through a fornix incision in the lower nasal quadrant. A nonabsorbable 6-0 prolene suture was tied at the muscle insertion. The muscle was incised from its insertion. Next, the LR muscle was hooked. Two single arm 6-0 Vicryl sutures were placed at desired distance from the insertion as is done in a routine resection of rectus muscle and another pair of 6-0 Vicryl was placed at the insertion. The muscle was then incised from its insertion, and the posteriorly (distally) placed 6-0 Vicryl sutures were passed through the original insertion as in a routine rectus muscle resection. The excess muscle stump was then cut. The stump was then placed at the MR site, and the distal end of this stump was sutured with the proximal end of MR with the 6-0 prolene already placed on the MR [Video 1]. The now elongated muscle was sutured at desired site from the original insertion site of MR as is done in a routine rectus muscle recession. The mean age of the 22 patients was 32.21 ± 13.1 years. The mean preoperative angle was 92.4 ± 13.5 pd base out. The mean postoperative angle at the end of 2-year follow-up was 12.3 ± 9.9 pd. The amount of deviation was more or less constant over a period of 2 years. There was no delayed deviation or enhancement of the result after 3-month postoperative period. The average correction was calculated using by dividing the total amount of deviation by total amount of recession + 2X (resection in mm). The average correction achieved per mm was 4.1 ± 0.3 pd/mm. The adduction restriction was calculated on a scale of 0–4 with 0 representing no restriction of adduction and 4 representing nil adduction. The adduction restriction was 1 or less in all the patients postoperative at the end of 2 years except one patient. The abduction was normal in all the patients. Some concerns were raised by Bhambhwani et al. regarding the stability and the surgery being akin to a hemihang-back sutures. Indeed, for such a large angle we believe that the options could be hemihang-back, very large unconventional recessions of the MR muscle or very large unconventional resections. Such large recessions are not done for comitant angles since the surgeon may induce severe restriction and therefore incomitancy even after getting a good primary position result. The other option could, therefore, be an elongation of muscle. This could be achieved by marginal myotomies or adding a silicone band or nonabsorbable sutures. Silicone bands have been used successfully in Brown's syndrome for muscle elongation and so are chicken sutures., However, these bands are used as spacers and between the cut ends of the tendon and not at the insertion. Using it close to the insertion under the conjunctiva would certainly lead to extrusion. Since there is little experience with these bands and sutures, we feel it is much safer to use the muscle stump for such a procedure. However, the major problem with such use was that the expander would have to be sutured to the globe for insertion, and second, it may get extruded  with disastrous results. The muscle transplantation effectively gives you the opportunity to correct very large angle cases with a single eye surgery [Figure 1]. With the help of muscle transplantation, the effective length of the muscle could be increased and therefore the results could be improved. The chances of any rejection of the transplanted muscle are virtually nil. We believe that the movement restriction in the extreme gaze on the side of the muscle transplantation is seen as a result of the excessive weakening of the muscle, but the muscle is still anterior to the equator, and therefore the motility restriction is minimal. This, however, cannot be compared with a large conventional large recession which would place the new insertion posterior to the functional equator. 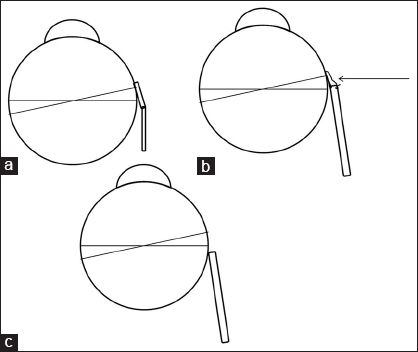 The ocular motility in a muscle transplant postsurgery remains excellent [Figure 2], [Figure 3], [Figure 4]., The unconventionally large recession invariably ends up in having motility loss. We present pre- and post-operative pictures of another patient who underwent muscle transplant for a large angle esotropia. The postoperative pictures clearly show minimal adduction loss even after muscle transplantation [Figure 2],[Figure 3],[Figure 4]. A hemihang-back recession will also have two major problems, first, the muscle may creep forward with such a large recession on hang back (we are doing close to 14–15 mm from the insertion and almost 20 mm from the limbus), and the second obvious problem that it would attach to a point which would be posterior to the arc of contact, and hence, the restriction of ocular motility in the ipsilateral direction would make it a big incomitant procedure [Figure 1]. Our series of 22 patients show that a very large angle esotropia can be successfully treated preserving the comitancy by a single eye surgery with a stable outcome for 2 years. True muscle transplantation is a safe procedure for large angle esotropia. The procedure is stable in long-term also. This simple yet innovative procedure should be in the armamentarium of a strabismus surgeon dealing with very large angle esotropia patients. Jethani J, Amin S. Loop myopexy with true muscle transplantation for very large angle heavy eye syndrome patient. Indian J Ophthalmol 2015;63:71-2. Jethani J. The muscle transplantation and loop myopexy in so-called heavy eye syndrome. 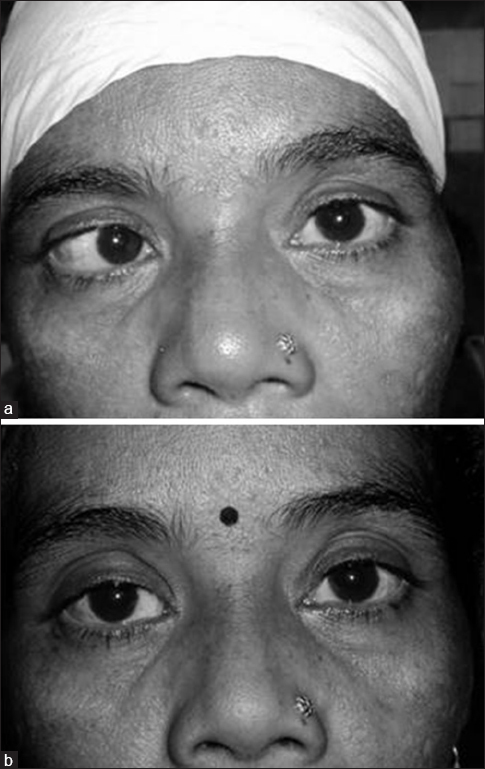 Indian J Ophthalmol 2015;63:558-9. Hiatt RL. Extraocular muscle transplantation. Trans Am Ophthalmol Soc 1973;71:426-58. 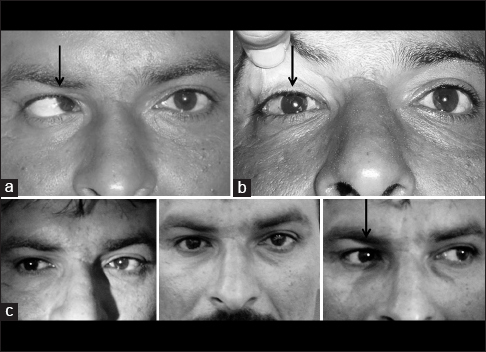 Amitava AK, Goswami AK, Mishra A. Large-angle strabismus and primary true muscle transplantation. J Pediatr Ophthalmol Strabismus 2005;42:211-5. Diamond GR. True transposition procedures. J Pediatr Ophthalmol Strabismus 1990;27:153-6. Bhambhwani V, Kadav M, Aparnaa C, Pandey PK. Heavy eye syndrome: Role of recessions, resections, loop myopexy, and transplants. Indian J Ophthalmol 2015;63:558. Wright KW. Results of the superior oblique tendon elongation procedure for severe Brown's syndrome. Trans Am Ophthalmol Soc 2000;98:41-8. Wright KW. Superior oblique silicone expander for Brown syndrome and superior oblique overaction. J Pediatr Ophthalmol Strabismus 1991;28:101-7.